Maintenance is one of the most important roles at Glaciers Edge Maintenance. It is the Maintenance Technician who not only helps customers by repairing a leaky faucet or fixing the decks to enjoy those long summer days, they are the ones who puts customers at ease with their customer service skills and knowledge expertise. It is the Maintenance team who keeps our commercial and residential clients loving their property, and referring their friends and neighbors. Thank you all very much for entering! We do have some additional surprise items that were not drawn in the video, and will be sending or delivering those this week. We will be doing another giveaway next winter, so keep an eye on your inbox! [vc_row][vc_column][vc_column_text]Every year we tend to forget about our mowers for 6 months. Well today is the day, the day we can start thinking about them again. It’s time to usher in a new era, and almost time for the “Changing of the Guard” (from snowblower to mower). As we plan to retire our blower to the shed, and prep our mower for the short summer season, use these helpful tips to help extend the life of both machines. I always recommend bringing your mower out and giving it a good checkup before the mowing season begins. This is something most people can do themselves, but there are professionals in Anchorage that can do it for you. Here at GEM, we go through all of our mowers starting in late March, and this article can help guide you through your lawn mower maintenance. We are a well established facilities and grounds maintenance company in Anchorage. We have been in business for over 10 years and service ALL aspects of the landscape process. We are currently looking to expand in our lawn maintenance, and need a good team leader to help facilitate that growth. Is thatch hurting your Anchorage lawn? Taking care of thatch is one of the first steps in kicking off your summer lawn care. This nuisance can easily be overcome, and should be taken care of on a regular basis. Thatch is a naturally occurring layer of roots, stems, and other pieces of organic debris from tree leaves and seeds. Some thatch is good, and can help your lawn regulate the temperature of its roots, by blocking sun, and insulating at night. This thin layer of thatch (1/2″) is great for preventing your lawn from drying out from the hot summer sun. Too much thatch, however, can wreak havoc on your lawn, as well as looking very unsightly. 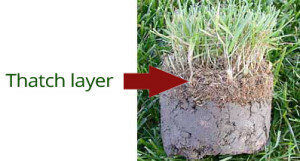 Thatch occurs when new grass growth occurs faster than the decomposition of the old growth. We have all heard the adage the grass is greener on the other side of the fence. This is certainly not always true, but it may demonstrate that your lawn requires more time, energy, and expertise than you are willing to provide. I know some people truly enjoy spending time with their lawn, but we are going to look at some of the reasons the rest of us may look towards hiring a lawn care company to help manage our outdoor areas.